North Creek, NY – I first visited Gore Mountain during graduate school in the mid 1980s. The southern Adirondack ski and snowboard area felt like an intermediate local hill just north of the ever-growing Capital District surrounding Albany, with lots of crowds, long lift lines, and a lack of challenging terrain. For most of the next two decades I would cut east just south of Lake George and drive an extra hour or two to ski and snowboard resorts in Vermont’s Green Mountains for my fix of big mountain eastern skiing. Nearly twenty years later, I revisited the New York State-owned and operated ski area in North Creek and found much more than back in my college days. Huge improvements since my early experience at Gore have transformed this ski area into a resort that rivals many in Vermont and New Hampshire. With its 2,100-foot vertical drop, 86 trails on 344 skiable acres and recently reconfigured lift system, Gore Mountain offers an experience comparable to many better-known New England ski resorts. Since the 1980s, the Olympic Regional Development Authority (ORDA), operator of Gore Mountain, has invested in new trails, a high-speed eight-passenger gondola, and major enhancements to snowmaking and grooming. In 1996, Gore Mountain was able to tap the Hudson River as a water source for snowmaking, quadrupling its capacity to make snow. Expert level skiers were honored with the cutting of the double black diamond trail “Rumor” in 1995. The Top Ridge area off Bear Mountain now offers an additional five runs, four of which are rated black diamond and two of them challenging glades. In fact, since my first visit 13 glades have been added to the trail map. Just this past year five new glades were added to Gore’s downhill trail mix, many of which I’d sampled with local woodchucks before they were “official.” It was only a matter of time before these fabulous wooded wonderlands would be frequented regularly enough to land on the map, and special thanks go to the locals who maintained these glades over the years. The addition of these numerous glades has truly enhanced the expert-level selections off the main trails in the Adirondack forest. My visit to Gore Mountain occurred during a lean snow year marred by nearly weekly rain events. By early March the base was bulletproof and powder days were few and far between. A storm had passed just to the south, leaving only a few flurries and a lot of wind in the southern Adirondacks. When most ski areas in the East had extensive lift closures and wind holds, Gore Mountain kept all lifts running with only a thirty minute wind hold first thing in the morning for the North Woods Gondola. Mountain. Pictured here is the trail Showcase. We knew for sure that plenty of areas would be wind-sheared, but Gore’s grooming and snowmaking crews had surprised us, working very hard in high winds to keep the mountain covered in soft, skiable snow. Skiing was great considering the difficult weather conditions, and even some of the glades were open. A huge late-season snowmaking effort continued throughout the whole weekend. Mountain operations normally wrapped up snowmaking in February, but pushed their efforts a few days into March to overcome the adverse weather, buoyed by ideal temperatures and humidity levels. Crews blew large quantities of soft snow on Rumor, Hawkeye and Lies, leaving creamy surfaces on steep faces that transformed throughout the day into sweet fields of moguls. Conditions on blue-square cruisers ranged from wind-buffeted bulletproof “eastern hardpack” to neatly groomed corduroy in the morning that yielded to a packed powdery consistency later in the day that you could really rail your edges into to carve perfect turns. Starting a ski day early has its benefits. You score good parking and there’s plenty of time to sip coffee and indulge in a fried egg, bacon and cheese English muffin before heading out onto the mountain. Even if it’s not a powder day, catching an early lift ride up the hill while the rising sun casts long shadows can be a truly uplifting experience. Ride the Northwoods Gondola up to the top of Bear Mountain. Take a warm-up run on Fox Lair to the trail beneath the Gondola, Wild Air. Carve first tracks on corduroy for a relaxing warm-up while the firm snow softens as the sun reaches the slopes. By the time you return to the base lodge, your friends will have their ski boots on and pile out of the lodge. The Gondola shelters its riders from the frigid morning air and is especially cozy if you have seven of your best ski buddies with you. 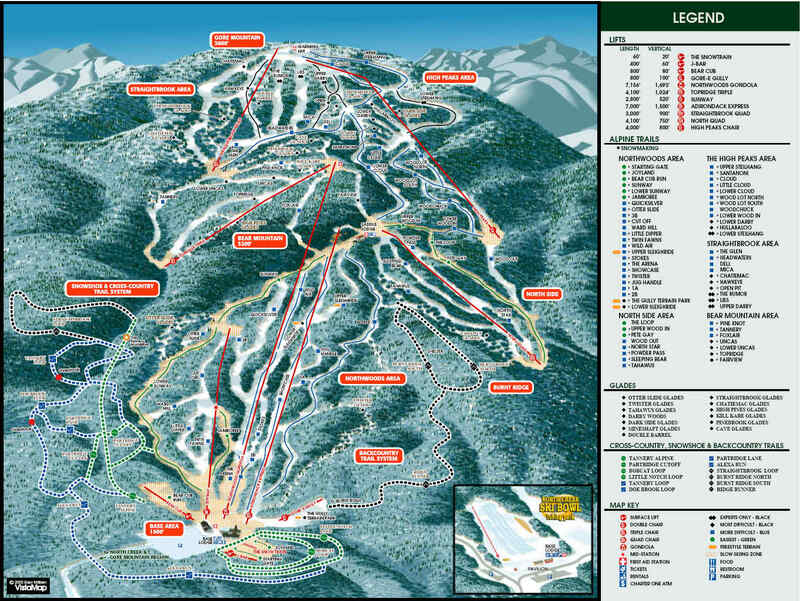 Click image to open a full-size Gore Mountain trail map. At the top of Bear Mountain, the troops are ready to rip. Head for the sun on the south-facing Topridge Trail where the lift is sheltered from northwesterly winds for most of its ascent. A run down Uncas or Pine Knot will drop you at the base of another sheltered chairlift, the Straightbrook Quad, which will lift you to the summit and 900 vertical feet of some of the best skiing on the mountain on about a half-dozen or so trails. Most of Straightbrook’s terrain carries a black diamond rating, including three double black diamond trails straight down the steep fall-line. One of these, Rumor, sports Yugo-sized moguls for most of the season, although the groomers will occasionally hook up the winch late at night and smooth down those bumps for a different kind of experience. Altitude has its advantages, and Gore’s summit trails generally have the best conditions with the most snow lasting late in the season. Chatiemac can be a nice cruiser when groomed, and with moderate pitch it’s a nice warm-up for some expert skiing. Hawkeye zigs and zags down the east side of the mountain with a nice steep section before a hard left turn. The Straightbrook Glade is on the left half-way down Chatiemac, and a bit further down Chatiemac Glade drops off to the right. Some cliffs and chutes will tempt thrill seekers when the snow pack is deep, though there are plenty of nice lines through the trees for mere mortals. If you go way out in search of fresh snow you will end up on Tannery which leads to Topridge. If you plan to return to the summit, bear left once the pitch relents and head back to the Straightbrook quad. The trail under the Straightbrook quad is known as Double Barrel. It actually has two paths, hence the name. It is only open when there is a good snow pack, as it’s very steep and rocky. When covered, it’s an expert skier’s delight along with several other fall-line boulder gardens at Gore. Just look under the lift lines and into the nearby woods. To reach the famed Rumor, and the other trails on that side of the summit, you must skate, pole and shuffle around the old gondola building. I dubbed this exercise the “Gore Mountain Shuffle”. There are a few other places on the mountain that you must employ this dance as well. Rumor is just around the corner, but one must shuffle further access the next pitch onto Cloud which leads to Rumor’s sister, Lies, as well as the north side of the mountain. The north side, also known as The Dark Side or the High Peaks Area on the trail map, harbors some of Gore’s most interesting expert terrain. Narrow trails like Lower Steilhang, Lower Darby and The Dark Side Glade always sport natural snow conditions, requiring precision to thread your way through boulders and cliffs. Darby Woods debuted just last season, and tucked between Lower Darby and Santanoni there are only a couple of lines in this narrow tree shot that holds snow exceptionally well. Hullabaloo is usually groomed for those who prefer a smoother ride. quad or further down Tannery to the TopRidge triple. There’s no need to return all the way back to the base for lunch, as the newly renovated Saddle Lodge offers limited snack bar-style fare and a brown bag loft upstairs. It is especially cozy sitting next to the fireplace built with garnet tiles excavated from the nearby Barton mine, a recent addition to the renovated lodge, and the large windows spanning both lodge levels offer a fantastic view of the High Peaks of the Adirondacks. It’s a great place to refuel and recharge and to dry off those mittens and neck gaitor by the fire. Gore Mountain makes no effort to discourage picnic lunches. At a warming hut at the summit, guests deposit their packs and coolers first thing in the morning before heading down the slopes. On a sunny spring day, picnickers will soak up the sunshine outside. One spring day an owl perched warily in a tree overlooking the picnickers, proudly guarding her lovely mountain. After lunch, head back for a few more bump runs from the summit or trek to a hidden glade. From the Saddle, head down Tahawus and keep your eyes peeled for a sign on the right marking the entrance to Tahawus Glade. There is a little uphill travel required so you must enter with speed and employ the Gore Mountain Shuffle to get to the goods. The narrow trail eventually opens up to reveal many lines to ski. After many tree-dodging turns you will pop out at the North Quad. There are a number of nice blue cruisers in the North Quad area for budding intermediates with nary a lift line; this side of the mountain is a sleeper. The local people of the Gore Mountain community are a special bunch of Adirondack folk, whether recent transplants from urban areas or long-time residents. Many have chosen the Adirondacks as their home away from the cities, where the mountains are high and the rivers run fast and cold. Many of the people who ski and work at Gore Mountain in winter can be found guiding rafts on the Hudson River in the summer. These folks truly love what the Adirondacks have to offer for recreation, inspiration and enjoyment of life. Just spend some time on the mountain with them and you will see. You may just get hooked and try to find a way to make it your home, too. Most season pass clientele hail from the Capital District – Albany, Schenectady and Troy – and the Northway corridor of I-87 leading through Saratoga Springs to Glens Falls, all within an hour or so of Gore Mountain. Thus Gore is primarily known not as a destination resort, but more of a local/commuter ski area. Adirondack High Peaks off to the north. Gore Mountain has no slopeside or on-mountain accommodations for the same reason as at ORDA sister Whiteface Mountain: it’s built on state land. One must find lodging in the valleys and villages. Along Peaceful Valley Road, at the base of Gore’s access road, a half-dozen or so small ski lodges and a few modest vacation homes dot the shoulders, many built in the Adirondack camp theme with basic accommodations. If you want fancy, then you’ll have to travel to The Sagamore at Lake George, just 30 minutes down the road. Lake George’s plethora of lodging ranges from a Holiday Inn to lakeside cottages. Just five minutes from Gore Mountain, where Peaceful Valley Road intersects with Route 8, sits the Black Mountain Ski Lodge. Under new ownership, this old motel has been recently renovated to provide clean, basic, affordable and “Adirondacky” accommodation with wood paneling and retro furniture. The motel’s former office has been transformed into a comfortable bar with a dining room and a large, warm fireplace. The office has been moved into a closet. When you arrive, just go in and tell a waitress that you have a reservation and she’ll get your key from the closet. Since lodging is quite limited within five miles of the ski area, it is highly recommended that you make a reservation in advance. The Black Mountain Ski Lodge allows visitors to return from skiing, have a few drinks at the bar, eat dinner and relax without a need to drive anywhere. Enjoy a hearty meal after a day on the slopes. Home-cooked comfort food will soothe your soul and fill your belly. But if that is just too slow for you, then drive to the other end of Peaceful Valley Road and turn left. In one minute you will arrive at the North Creek Ski Bowl. It’s kind of like bowling, as there are alleys, but there are no pins to knock down and no money to win. But you will scream with excitement and laugh in ecstasy when you take a run on the tubing hill. A handle tow drags you on your large inflated tube to the top of a steep and icy alley. Get ready for a gravity-induced adrenaline rush. The Ski Bowl is North Creek’s original ski area. The first snow train brought city-bound skiers to North Creek in 1934. In 1946, a 3000-foot T-bar was installed to lift skiers through the 1970s. Trails on the mountains behind the tubing park have since grown over, but plans are afoot to waken this sleeping bear by developing an interconnecting lift and trail system connecting it to Gore Mountain. The New York State legislature passed an amendment enabling ORDA to expand the operation of Gore Mountain to the Ski Bowl. Developers have already drawn up plans for a base lodge, condominiums and hotels on the property, providing slopeside lodging with easy access to the quaint village of North Creek. The Cloud trail, near Gore Mountain’s summit. North Creek is very small, with a supermarket, a sports/ski shop, antique and gift shops, and restaurants including Marsha’s, a homey diner that serves filling breakfasts. If you don’t have time for breakfast, you can get a delectable baked treat and a latte to go at Sarah’s just a few doors down. Many believe this village will soon flourish with the development of the Ski Bowl. Just outside of the village on Route 28 is Casey’s North, the place to warm up after snow tubing. You will find locals and tourists sharing adjacent stools at the bar where the food is varied and you can probably catch the game on one of the TVs or enjoy a ski video on the big screen. If you are really hungry, drive to North River and turn left on Thirteenth Lake Road to the Garnet Hill Lodge for their all-you-can-eat buffet. Garnet Hill’s cross country ski center is a wonderful forest retreat way off the beaten path. If you need a break from schussing down the steep slopes of Gore Mountain, a day of cross country skiing or snowshoeing in the silent woods to The Vly or other scenic destinations may fit the bill. Top it off with their dinner buffet and you’ve had a full day. Gore Mountain also sports cross country ski trails as well as snowshoe trails. There is more at Gore to keep anyone busy in the winter. The southern Adirondacks have won my heart and keep me coming back for more.